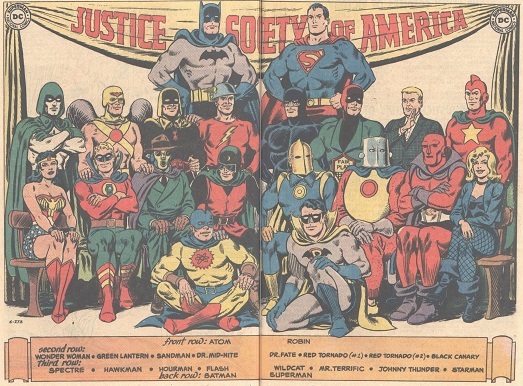 Justice Society of America: World's Greatest Heroes? Re: Justice Society of America: World's Greatest Heroes? I think you got the better end of that deal. You got The Avengers too, though, didn't you? Silogramsam wrote: who are you really, major? Peter David? His mom? did you get The Man from U.N.C.L.E.? Oh, yeah-I loved that show! 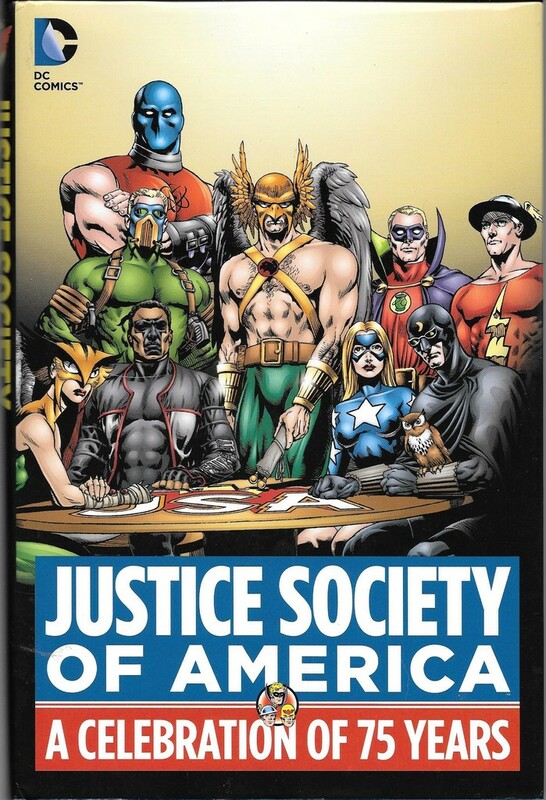 Been looking at this book released last year, a celebration of the JSA's 75th, and the contents baffle me. As a representation of 75 years of the team's adventures, they seem seriously skewed in favour of the Silver Age (not the era the team originated in) and the modern era (post 1990) and they've also made the baffling decision to publish several parts of stories rather than complete ones. So, we have two complete Golden Age stories, followed by their first team-up with the JLA from JLA #21-22; so far, so good. But then, we have the second parts only of two more team-up tales from JLA #30 and #47 (why not just pick one story and print both parts?) followed by another complete two parter from #82-83, giving us about 150 pages of Silver Age material that's often focused more on the JLA than the JSA. The entire Bronze Age, a period in which the team actually had their own book again for a couple of years amongst many other appearances, is then basically represented by one 17 page flashback story from Adventure Comics, before we get an inexplicable shift to the eighties and two stories from All-Star Squadron. Didn't the 70s deserve more than that? Then, the book is rounded out by more incomplete material, in the conclusions of three separate ongoing stories from 1992, 1999 and 2001, a story from 2007 focusing on the Superman from Kingom Come, and then an apparently random issue of the godawful new Earth 2 title which, as far as I can see, has no real connection to the original JSA at all! Why? I get the distinct impression whoever picked this lineup of stories really had no particular feeling for the characters at all...they didn't even include their origin story, for Heaven's sake! Well, in their slight defense, I think it's 75 years for a reason. They want to sell it to those who like the old stuff, but also people who might want to see where the team is now. And in the future. I think it would be hard to do a good overview of ANY of these characters, given how many versions there are and how some fans react to the versions they don't like. Sometimes I wonder if DC has a handle on who their audience actually is. They always seem so rudderless. Having pretty much half the book be random chunks of incomplete stories just seems pointless, though. New or old fans, who wants to read just the last part of a story? tony ingram wrote: Having pretty much half the book be random chunks of incomplete stories just seems pointless, though. New or old fans, who wants to read just the last part of a story? I don't disagree. I just think given the history, there's little hope of appealing to anyone, although complete stories would seem a better idea. Complete stories, and a more even mix of the different eras, I think. Plus, wasn't one of the stories included (from All-Star Squadron #67 in 1987) actually a retelling of another story told in the book (All Star Comics #4 from 1941)? And they didn't even include the "origin" of the JSA (originally from 1977 but later retold/revised in 1988), did they? No, in fact they actually apologized in the foreword for leaving the origin story out! Said it was a question of space. Utterly bizarre. Since the origin wasn't written until more than thirty-five years after the teams first appearance, that might be a slight excuse. But with the story from All-Star Comics #4 getting two different versions, you would have thought the All-Star Squaron issue would have easily been left out to include something else. I'd have left out that boody awful Earth 2 issue, myself. tony ingram wrote: I'd have left out that boody awful Earth 2 issue, myself. Well, that goes without saying . . . but maybe when DC was assembling the collection, somebody in charge still wanted to believe Earth 2 would actually be the successful replacement for those "old guys". There's always one in any group who's totally out of touch with reality, isn't there? tony ingram wrote: There's always one in any group who's totally out of touch with reality, isn't there? But if we're talking about DC comics, it might be Dan <REDACTED>! That is one of my favourite JSA images ever. Though I previously saw it in the Steranko History of Comics (but without color) many years before that. 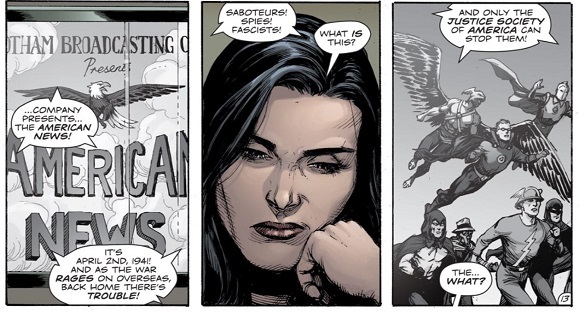 Well, we've finally seen the JSA again, albeit just a couple of panels in Doomsday Clock #8, where Lois Lane has been sent a mysterious flash drive with old news footage from 1941 on it featuring a team of heroes she's never heard of...I guess it's progress! tony ingram wrote: Well, we've finally seen the JSA again, albeit just a couple of panels in Doomsday Clock #8, where Lois Lane has been sent a mysterious flash drive with old news footage from 1941 on it featuring a team of heroes she's never heard of...I guess it's progress! I know if there's a room filled with garbage and you remove one piece of it that's technically "progress", but it seems like it's no better than giving a starving person some bread crumbs unless something much bigger comes of it in the very next issue. And I have since gained a major concern that with the way Johns paces things, any actual "return" will be rushed and just thrown out there, or could possibly instead be saved for a separate mini-series (the way the Three Jokers subplot from DC Universe: Rebirth is being saved for a separate Prestige Format (or whatever) mini-series). I would like to be hopeful, but I'm afraid DC will just twist on stomp on those hopes (AGAIN). 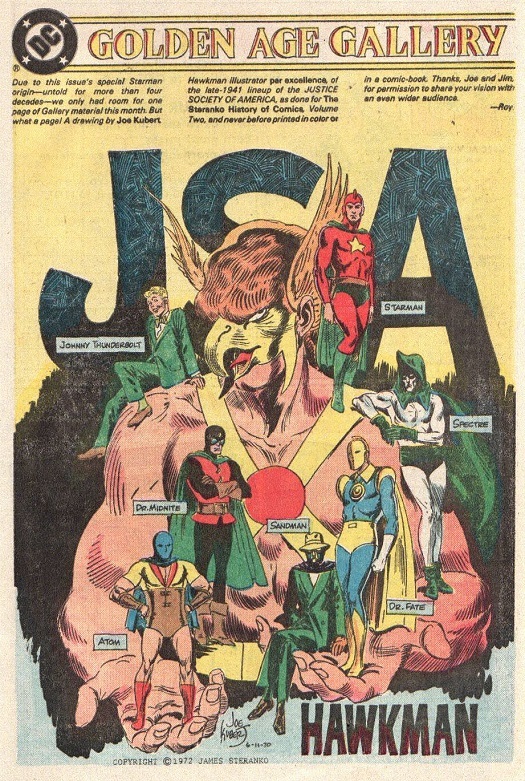 You might be right, but I prefer to be a glass half full rather than a glass half empty guy, when it comes to the JSA. Can I just take a side moment and wish you, and all of Britain, the best in dealing with this? We are having our own issues here, but yours seem to be so much more precarious. I would wish anyone going through such massive change well, but people I actually care about, in a country I like? You get ALL the best wishes. Take care. Thank you. It is a very problematic situation, not least because it has divided the country in a way I can't recall ever seeing before. I'm used to political differences provoking arguments, but this seems to be an ideological difference provoking absolute hatred even between people otherwise on the same page about virtually everything. It is dividing families! And however it turns out, there seems to be no possible "good" result, now. I wonder if Britain will just break down and have the people vote again on whether they're still in favor of "Brexit" (now that some idiots who voted for it may realize they didn't really understand what they were voting for in the first place). And if they do that? And if enough people have changed their minds to change the outcome, say two million or so? Do you imagine all of the other fifteen million who voted leave will happily accept the fact that their victory in the first referendum has been overturned, that their opinions don't count? Hardly democratic, is it? We'd have rioting in the streets. We'll probably have it either way. tony ingram wrote: And if they do that? And if enough people have changed their minds to change the outcome, say two million or so? Do you imagine all of the other fifteen million who voted leave will happily accept the fact that their victory in the first referendum has been overturned, that their opinions don't count? Hardly democratic, is it? We'd have rioting in the streets. We'll probably have it either way. I don't know if there's any good, workable solution no matter how you slice it. At least giving people a second chance at a vote may at least show a path forward. I think it would just divide us further and leave millions totally disillusioned with the whole system. The minute Cameron made the disasterous decision to hold a referendum without having any plan beyond that, it was too late to save the situation. tony ingram wrote: but this seems to be an ideological difference provoking absolute hatred even between people otherwise on the same page about virtually everything. It is dividing families! And however it turns out, there seems to be no possible "good" result, now. This sounds so much like what I see here in the US, and that isn't good. We definitely feel like everything is horrible, and I wish it weren't sounding like you see the same. I don't know what any of us can do, but I really want you all to be safe and well.